During the last couple of weeks, several reports indicated that Niantic was gearing up for the release of the second-gen Pokemon, introduced in Pokemon Gold and Silver more than a decade ago. 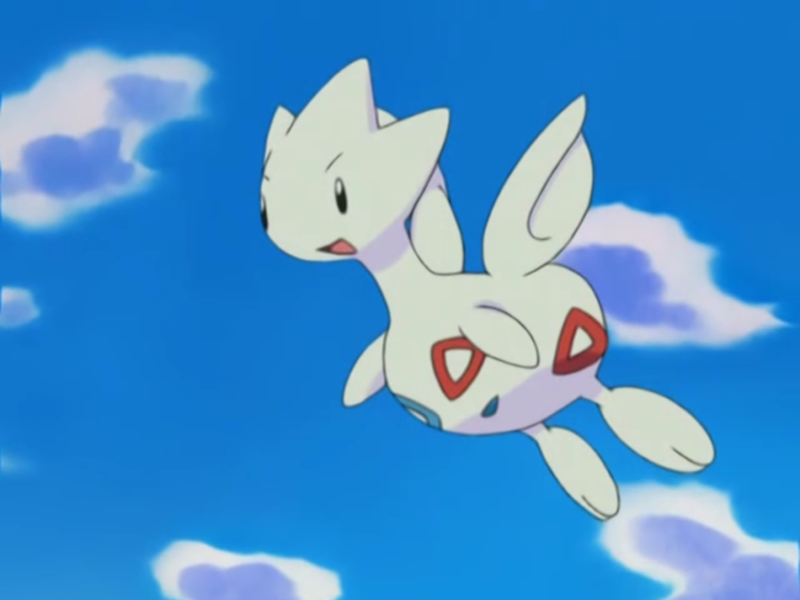 Most notably, data-miners at The Silph Road found data in the game code referencing the second-gen Pokemon. There was also that infamous Starbucks e-mail leak, which hinted that new Pokemon are on the way. And just last week, Niantic officially teased new Pokemon coming to Pokemon Go. However, when the time finally came, it wasn’t what all players expected. 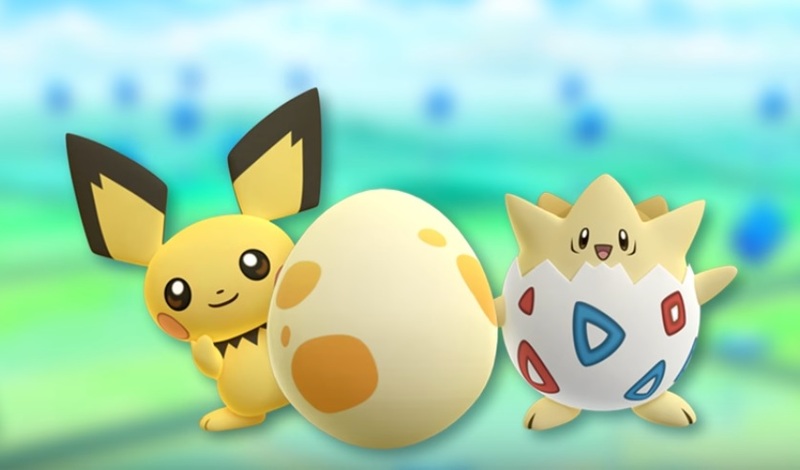 Instead of the entire second-gen lineup (excluding legendary Pokemon), we were treated to a grand total of seven new Pokemon: the Baby Pokemon. Well, actually, it’s eight new Pokemon when you count the evolution of one of them, which is also a second-gen Pokemon. 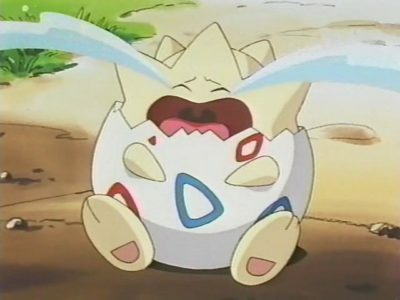 Niantic didn’t even have the heart to release all the second-gen Baby Pokemon. Last checked, there were eight Baby Pokemon that came with Pokemon Gold and Silver. But hey, at least we have new Pokemon to add to our Pokedex, right? Aside from their cuteness, these Baby Pokemon aren’t really especially noteworthy. You can send them to battle, but you’ll be burdened with the guilt of sending a newborn Pokemon into battle and then watching it get crushed by, let’s say, a “Hyper Beam.” The seven Baby Pokemon are Pichu, Cleffa, Igglybuff, Elekid, Magby, Smoochum and, arguably the most popular of them all, Togepi. Curiously, Niantic did not include little Tyrogue in the mix, which is the pre-evolved form of Hitmonlee, Hitmonchan, and fellow second-gen Pokemon Hitmontop. First of all, Baby Pokemon can’t be encountered in the wild. They can only be obtained via hatching Pokemon eggs. And before you go running off with your stock of Pokemon eggs, know that the Baby Pokemon will only hatch in an egg acquired after the release. Meaning, if you have five Pokemon eggs at hand before Niantic unleashed the Baby Pokemon, none of those five will ever hatch into a Baby Pokemon. So, yeah, you need to acquire new Pokemon eggs again if you want to get your hands on the Baby Pokemon. In Pokemon Gold and Silver, these Baby Pokemon were similarly only attainable via Breeding and Pokemon eggs. It’s not like Niantic is doing anything different. If you want an easier way, you can simply buy a Pokemon Go account with the Baby Pokemon already hatched for you. There are three different egg categories in Pokemon Go: the 2km, 5km and 10km eggs. The distance corresponds to the distance you need to walk in order to hatch the eggs. Niantic also applied the same thing to the Baby Pokemon. Pichu, Cleffa and Igglybuff hatch in a 2km egg; Togepi hatches in a 5km egg; and Smoochum, Elekid and Magby hatch in a 10km egg. You could say the latter three are the “rare” ones. However, Niantic has not yet released official data regarding this. The aforementioned information is courtesy of the online Pokemon Go community. If you have been playing Pokemon Go extensively, then you probably know which first-gen Pokemon these Baby Pokemon evolve into – except Togepi. None of the evolved Pokemon are especially noteworthy in battle. So you’ll most likely go Baby Pokemon hatching just for the sake of Pokedex completion. As mentioned, Togepi is the exception. The cute little egg Pokemon, apparently, can be evolved into Togetic, one of the second-gen Pokemon. According to reports, you need 50 Togepi Candies to evolve it into the still-egg-looking bird Pokemon. But there’s no concrete information on this yet, which isn’t really surprising since the Baby Pokemon have only been around for less than a week. So…what about the other second-gen Pokemon? The Baby Pokemon come with their respective Pokedex numbers and entries. If you acquired a Pichu, it will show up as Pokemon number 172 in your Pokedex. Meaning, Pokedex numbers 151 up to 171 would be empty. Well, 145 to 171, actually, seeing that the first-gen legendary Pokemon are still not yet in the game. This could mean that the other second-gen Pokemon are not far behind. If Niantic plans to release them much later, then they could have released the Baby Pokemon without their proper Pokedex tags. Like a special batch of Pokemon or something. The most likely reason why Niantic refrained from releasing the entire legion of second-gen Pokemon is that snow season is upon us. Well, at least in countries where there’s winter. The cold weather isn’t exactly ideal for Pokemon hunting. Players would get colds or get into accidents caused by slippery pavements. Niantic was probably only looking out for its players. Compared to hunting and catching Pokemon, hatching Pokemon eggs is more favorable as an outdoor activity. It’s quite a shame, really, considering Niantic also recently activated the new “Nearby” feature in more locations. The new tracking system is a significant upgrade from the useless “Sightings” feature. But don’t tell that to players living in rural areas. The Nearby feature could have shined even brighter if there are actually new Pokemon to hunt and catch. If you’re not impressed with the Baby Pokemon, Niantic also released a limited edition Pikachu. The Santa Hat-wearing Pikachu is officially known as “Holiday Pikachu.” It can only be caught in the wild until December 29, 2016, 10:00 a.m. PST. However, you can still keep the limited edition Pikachu even after the said date. Just make sure you don’t hand it over to the old professor. 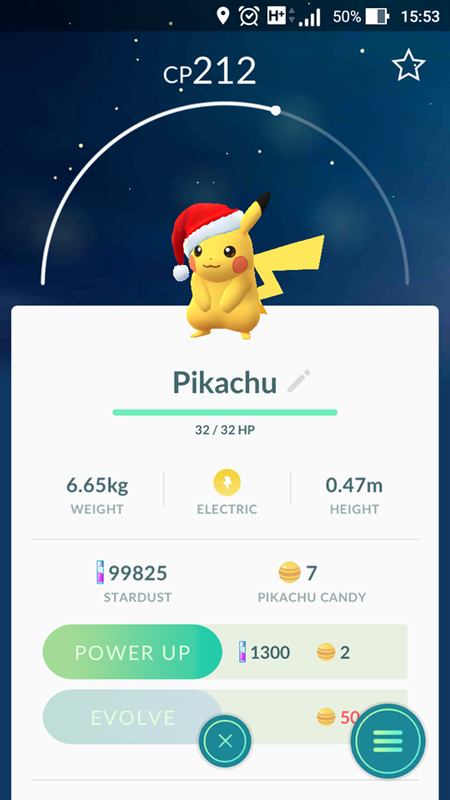 The Holiday Pikachu does not come with bonus stat boosts or other gameplay-changing attributes. It’s merely an aesthetic change, similar to Champion Skins in League of Legends. And yes, Holiday Pikachu can also evolve into a Raichu, which will keep the Santa Hat. So that’s sort of a two-in-one bonus. But it would have been a lot better if Niantic simply released Chikorita and co. Guess we’ll have to wait until 2017 rolls around before we can get our grubby hands on the mighty Tyranitar.